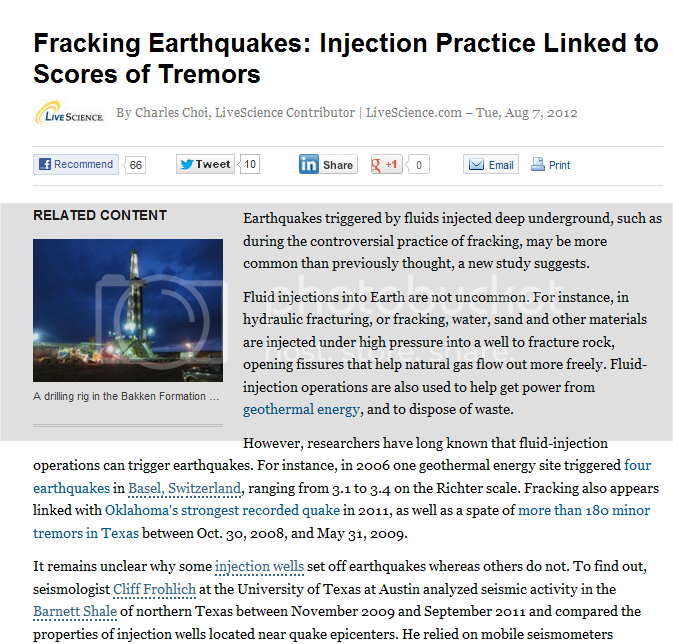 More "Fracking" Nonsense About Earthquakes | Watts Up With That? Figure 1) Junk science journalism at its best. Wastewater injection wells hydraulic fracturing (AKA fracking) are not the same thing. Are the science journalists ignorant of science? Or are they intentionally misleading the public? Earthquakes triggered by fluids injected deep underground, such as during the controversial practice of fracking, may be more common than previously thought, a new study suggests. Firstly, there is nothing “controversial” about fracking. Fracking has been a common well completion practice for more than 50 years. The practice of large-scale fracking of shale formations is somewhat more recent… But even that practice is 30 years old. Mitchell Energy was fracking the Barnett Shale in North Texas and the Bossier Shale in East Texas back in the 1980’s. 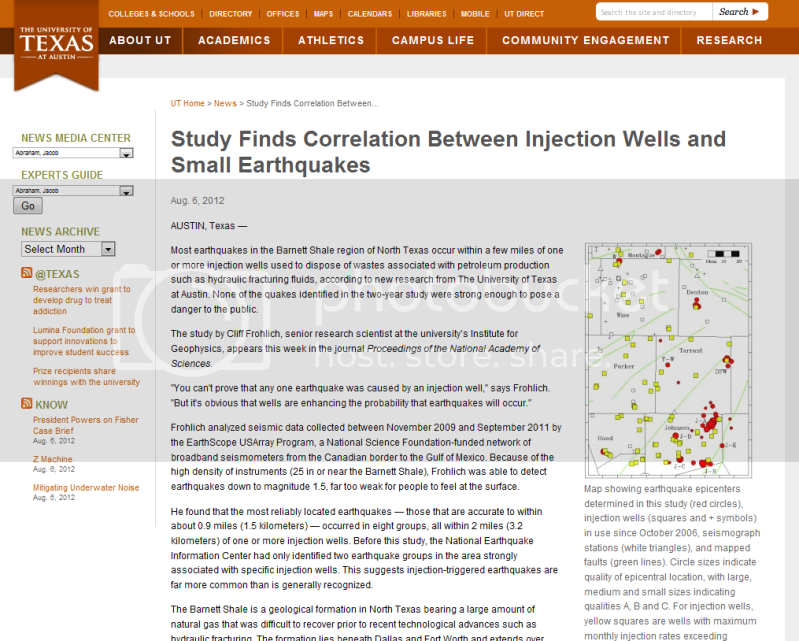 Figure 2) Frohlich, 2012 found some correlation between wastewater injection wells and very minor induced seismicity. Texas map showing the Barnett Shale (gray) and rectangle indicating region mapped in figure 2. Credit: Cliff Frohlich/U. of Texas at Austin. Hydraulic fracturing is an industrial process in which water and various chemicals are pumped deep underground in order to fracture rock, allowing oil or gas to more easily flow to a well. As petroleum is produced at the surface, most hydraulic fracturing fluids return to the surface too. Frohlich is careful to point out that he did not evaluate the possible correlation of earthquakes with the actual hydraulic fracturing process, but rather the effects of disposing of fracturing fluids and other wastes in these injection wells. And finally, as I have previously posted, the induced seismicity from fracking and most injection operations is almost entirely nonpalpable. August 10, 2012 in Alarmism, Earth, Earthquakes, Energy, Fracking, natural gas. More BS from the Greens trying to stop the use of gas as it is cheap and clean, they just want more windmills. Fracking causing earthquakes complete and utter rubbish. They are intentionally misleading the public. Sometimes unexpected things do happen. It was not exactly fracking, but rather a geothermic drilling. When it comes to earthquates, I think it is critical to separate the fracking operation from the fluid disposal operation. My opinion is that the fracking is not and cannot be the source of earthquakes. But I believe there is ample evidence that high volume fluid disposal in deep wells can be the source of induced seismicity. See my comment from March 12 where I discuss the Denver Rocky Mountain Arsenal #3 well and its almost conclusive connection to a quake series in north Denver from 1965-1968. Google “Rocky mountain arsenal injection well” for a list of documents that investigate a series of Earthquakes that Denver experienced from 1964 to 1968. USGS Earthquake records indicate they were shallow (about 5 km). The Rocky Mountain Arsenal had a 12,074′ well to dispose of waste water into the deep Denver strata. In 18 months from 1965 to 1967 they disposed of 165,000,000 gallons. Because of the earthquake activity, they sealed the well. Where I think the story gets most interesting is that about 6 months, 11 months, and 18 months AFTER the well was sealed, Denver experienced its three biggest quakes: Magnitude 5.1, 5.3 and 5.5. These were shallow (5 km) and within a few miles of the well. The activity then declined. (This can be verified on the USGS Earthquake Archive). In 1968 the well was briefly reopened and some liquids were pumped out to [reduce] formation pressure. “I didn’t find any higher risks from disposal of hydraulic fracturing fluids than was thought before” – Since there are people who believe high volume disposal can cause quakes, Frohlich’s comment is quite ambiguous. What was thought before? All the wells nearest to the eight earthquake groups reported high injection rates (maximum monthly injection rates exceeding 150,000 barrels of water). 150,000 bbl/mo = 6,600,000 gal/mo. Denver was about 9,000,000 gal / mo for 18 months. Hypothesis: It is not necessarily the max rate but the volume, at least in part. How long have these frack recovery fluid disposal wells been active? Injection into formations near faults might be a fault trigger. But is that the only mechanism? That the biggest Denver quakes occured months AFTER the injection stopped is I think a key to understanding another mechanism. Thermal contraction and expansion might play a part as well as pore pressure changes. A large volume of cool water during disposal can contract the formation causing minor quakes from settling. After the well is abandoned and sealed, Geothermal gradient heating will slowly expand the rock, but the stresses will be larger as it fights the accomidation during the prior settling. Larger stresses = larger quakes some time after the disposal well is sealed. So check quakes against cumulative volume as well as rates of fluid. “Might’, ‘maybe’, ‘perhaps’, ‘possibly’, I really think adverbials of probability should be banned from all documents relating to climate change/disruption/warming/earthquakes from any media publication/TV documentary. WTF? This entire study was done using the latest system of seismometers put in place for just this type of reason. The science sure seems pretty good and he notes that these tremors do not happen in some sites but do in others and offers explanations. But reporting something is not much of a problem doesn’t sell newspapers. along with the supposed earthquakes everywhere else it’s done in the. east is also clearing its tubes. The alarmists who try to scare everyone over the risks of earthquake totally ignore the fact that by inducing a minor quake you reduce the tensions that could have lead to a major one. People not used to quakes, like the majority of us in the UK, would not even realise what these small quakes were if we felt them at all. Underground nuclear testing produced no serious earthquakes so fracking certainly would not. a new study “suggests”……“It might be” that an injection can…. And may I “suggest” that “it might be” that a rain dance could provoke rain? I mean, it might be? It must be the heatwave making those tree-huggers feel tremors. Since earthquakes can be very damaging to life and property when the stresses are not relieved incrementally but build up go all at once then why isn’t fracking considered beneficial at relieving these stresses before the “big one” can happen? .. Maybe because there’s no connection. Mine too. The problem is they live in a world of their own; blind to reason, hard facts and inconvenient data, but inexplicably supported by a gullible public who believe everything green is good. A concept eagerly grasped by devious politicians seeking tax dollars and votes. As a practicing geologist, I simply do not understand the concept of why fracking is supposed to be bad for the environment. I came to the self-evident conclusion that the greenies recognised they needed to find a new revenue generating scam to replace the global warming one, which has now passed its ‘sell by’ date. Fracking is ideal to replace global warming, as the facts also can be twisted to produce scary predictions for a gullible public. And as we all know, scary unfounded predictions are a reliable way of generating tax dollars for ‘research’. Anti-frackers always conflate fracking, which is a transient well treatment, with injection, which is ongoing. The analogy I use is the comparison between a hypodermic injection and an IV. An ill-sited injection well might — might — cause a problem if it were injecting fluid into a potentially-active fault plane. It would not matter if the fluid injected were produced water, waste frac fluid, or mother’s milk. But injecting compresse CO2 underground is simply wonderful. Fracking radical environmentalists! They do get everywhere don’t they? I suggest that, as members of the scientifically illiterate public, journalists are ignorant of the boundaries (Popper’s problem) of science, confusing it with the validation of technology. With the investment in the technological Emperor’s new clothes, it is unlikely that the skeptical scientists’ cry will be heard. “But he isn’t wearing anything at all!” He has spent his money on marketeering! The press will spout, and people will believe what they want. One of these beliefs is that fracturing (I abhor the unword “fracking”) causes earthquakes capable of damage. The energy budget is just not there. And even after a simple scientific explanation to that effect, people will still dismiss with the typical “well, that may be the case, but fracking is still bad”, akin to the “well, global warming may not be serious, but we should err to the cautious just in case”. This seems to be the method of the uninformed, or that of the uncritical thinker. Nothing seems to dissuade them from this agnosticism. The press seems to know this, and in their smug way, exploit it to the max. It’s how “documentaries” like Gasland can get a foothold…promoting bold-faced untruth as fact. Exactly. The whole concept needs to be thrown right back into their ugly lying faces. My response to charlatans who say ‘fracking triggers earthquakes’ is – IT WOULD BE A WONDERFUL ADVANTAGE IF IT ACTUALLY DID! The first earthquake I ever felt was a quake attributed to the Denver Arsenal disposal well back in the early 1980’s. There are a lot of things that go into waste water disposal but the main thing that must be understood is that they are very closely controlled by the various states oil and gas production regulators (or at least it is in Wyoming). For 31 years my profession has been optimizing hydraulic fracturing. Yea, I was fracing when fracing was cool. I found it a bit awkward to tell casual contacts what I did for a living. Overtime I learned it was better to summarize as I help improve how fast the hydrocarbons come out of reservoirs. Now to see the average activist and journalist discuss “Fracking” is in one part showing their ignorance/poor comprehension, and the other their obvious bias. Then in using what is to them are “facts” that proves their position, like inducing earthquakes or contamination of aquifers, they show motives besides wanting to know the truth. Blind they become. Correcting their blindness can be almost impossible. It takes patience. In the course of waywardness they are hurting themselves and those around them. As presented earlier, the most likely connection is with continuous injection disposal wells around areas with existing stress faults. Injection may provide lubrication or increase stress till failure, but the magnitude to date is negligible. But in a world with uncertainties who knows if we might see a Macondo-like earthquake by chance. There is much more to learn by empirical observation. This is getting more like “whack a moley” or some rapidly mutating virus. You debunk their stuff and they jump into entirely new forms and areas. Newsflash: a)Fracking, temporarily increases pressure in the formation but the subsequent production of the oil/gas reduces the pressure even more. b) The Fracking is taking place mainly in areas where long time oil and gas production previously reduced the pressure. c) Major fault zones are not a feature of confined hydrocarbon reservoirs – they would have been conduits for the whole works to have leaked out eons ago – possibly like the Oil Sands of Canada, offshore Gulf of Mexico and California, and Venezuela,. The insidiousness of these indirect “carbon” is the problem, is that there is a huge public out there that sort of buys in to this kind of egregiously dishonest activist political science. Interesting to note that the extreme fear of fracking is now causing countries such as South Africa to build coal plants. People believe fracking is more damaging than CO2. Talk about environmentalists sabotaging themselves…. Most disturbing is the use of “may” in science papers. Really? Isn’t may or possible the realm of science fiction? Any may or could happen, anything is possible, as “Kwik” noted. (I’m never quite sure if the “may” is the news media or the paper itself. One hopes it’s the media, though evidence is it’s not the media.) Only “probable” counts. There are all sorts of “scary” stories out there. There was a big earthquake in Sichuan Province, China back in 2009. One American colleague was trying to tell me about the “secret” EM weapon and that agents had tested it on China and caused this particular earthquake. I explained to him the physics of EM and the amount of energy it would take to create an EM pulse big enough to create an earthquake, if indeed it could (like at least 1 nuclear power plants worth). I also pointed out that if anyone had some “secret” EM pulse weapon, that it would kill all the electronics within its range. I think I put that conspiracy to bed with that guy but who would know. For some reason there are these people with a doomsday mentality and would like to imagine some evil people behind it. Then they see themselves as Saviors. That is how I look at Greens. Doomsday saviors. Maybe they read too many superman comics when they were young. hmmm. Let’s talk about this one. If fracking causes an increase in smaller quakes which will only slip in the direction of least resistance, thus relieving tectonic stress, this is bad how???? Maybe what has been discovered is a way to prevent earthquakes that kill. A series of wells drilled along major distructive faults for the purpose of “fracking” them just might be the discovery of the century. In the sixties there was talk of drilling wells and setting off explosives to cause small earthquakes an so avoid the huge earthquakes. Maybe even small nukes. Sanity prevailed. The underground nuclear testing did not set off more earthquakes or prevent earthquakes. This pressure is going to be highly dependent on how fast or easily fluid moves into the formation. If the flow rate drops, the pressure builds, and the operation has to “throttle back” in order to stay within the limits of their permit. That the biggest Denver quakes occured months AFTER the injection stopped is I think a key to understanding another mechanism. Thermal contraction and expansion might play a part as well as pore pressure changes. Sounds reasonable… but another thing about Denver that the press seems to overlook, is the Rio Grande Rift. Given enough time, you can kiss the Rockies good bye. Your re-reading of the article appears to have further confused you. There’s nothing reasonable about your assumption. Froelich did not study fracking operations. He studied wastewater injection wells. Hydraulic fracturing is not a subset of injection wells. It is nonsense and it is also an attempt to shut down economical use of conventional energy. “… It was not exactly fracking, but rather a geothermic drilling. I’m on board with the AGW skeptic stuff, but I will likely never be on board with the “fracking is safe” camp. I cannot ever see how injecting toxins into the ground will ever be a good idea, and no one has adequately explained the flammable house water problem to me. I am, until I see evidence to the contrary, ashamed that this position is being taken up by WUWT. Methane is commonly present in ground water. Hence the prevalence of places in the U.S. called “Burning Springs” – NY, WV and KY, IIRC. Those names all predated drilling, you know. Thanks for the link Fred. Dr. Freulich explains fracturing and its aftermath and his research findings very clearly. I would that journalists would listen to such explanations. For the confused, fracking pumps fluids into a well then removes them. Injection pumps fluids into a well for disposal, i.e. they stay in the well. Yes, fracking can use millions of gallons of fluid, but it comes back out. The Rocky Mountain Arsenal problems are exactly the kind of problems that anti-fracking types hope for, but fail to find with fracking. If you pump billions, yes billions, of gallons of fluids per month into a faulted area, what are the chances that you’re lubing up a fault? Pretty good from the results, I’d say. On the other hand, drilling into a faulted area consisting of tuft, and then setting off nuclear explosions demonstrably doesn’t cause tremmors as a side effect – the ground shakes from the blast, but then stops. Geothermal quakes are a direct result of asking for trouble. You inject fluids into an area with known faulting, high temperatures, and then wonder that something happens? WUWT? David Middleton – can you provide a few paragraphs to explain how and why waste water injection and fracking are unrelated so other silent but similarly confused people can understand this? To be honest I read the article and came away thinking you were FOC but like most I’m not well versed in your field. Sounds like enough wiggle room to drive an aircraft carrier through. Words like “Maybe” and “Possibly” and common in the AGW community. When it comes to paying taxes for wind subsidies or higher utility bills I would not have the option of “Maybe” or “Possibly” paying them, if they are on my bill. “Radial Environmental Carpetbaggers” Well said. “…[C]arpetbagger was a pejorative term Southerners gave to Northerners (also referred to as Yankees) who moved to the South during the Reconstruction era, between 1865 and 1877. I presume that there are some evils to be found in wax candles as well. I guess we will all just have to eat more carrots…then again that would require that we add more fertilizer to the soil, and I suspect that there are placards against that too. My dear fellow, I think you’ll find that this gas in water mischief has been debunked many times over. As I understand it, there were no active fracking operations going on in the area at the time of the video, & it was demonstrated that the gas was already in the water before operations began. Fracking is safe it’s been operating for over 30 years without major incidents occurring. Listen to the geologists & the men & women working in the industry, & learn to not always believe that Big Oil/Gas is out to rule the world & make everybody poor, quite the opposite in reality! Then you are totally ignorant of the subject matter. The basic procedure is to pump a slurry of water and sand into the formation to expand natural fractures… Hence, hydraulic fracturing. The word “fracking” has a lot of different spellings. The media have generally settled on “fracking.” It is sometimes referred to it as “frac’ing” or “frakking” on scout tickets. “Frac” is the industry abbreviation for fracturing. The operation is generally called a “frac job.” I don’t think anyone ever gave the spelling much thought until the media started reporting about it. I tend to use “frack” because it seems to be the most common spelling in the mass media. The frac fluid will include other chemicals that facilitate the flow of proppant (sand) into the fractures and ease the extraction of the frac fluid from the formation. The mix of chemicals is tailored to the hydrocarbon reservoir and varies quite a lot. Halliburton’s Colorado DJ Basin WaterFrac formulation is ~96.3% water, 3.4% sand and 0.3% other chemicals. I suppose some of the 0.3% of “other chemicals” might not be safe for human consumption (although Halliburton does have a potable frac fluid). Now, this may come as a total shock to you… The frac fluid is pumped into “hydrocarbon” reservoirs. Hydrocarbons, like oil and natural gas liquids tend to already be rather toxic to humans before the frac fluid is pumped into the reservoir. Studies have been done showing that fracking is safe. I have conducted my own study that suggests new studies which suggest things are nothing but useless suggestions. Furthermore, I suggest that the parade of studies and suggestions relating to climate may be contributing to more to global warming than CO2 emissions. I suggest AGW arena takes a time out from making suggestions. “Our Big Oil” pals have recently** been secretly extracting CO2 from Oil as part of manufacturing of gasoline, diesel, etc. and “saturating fracking fluids with the CO2” to hide said extracted CO2 from “E.P.A. and Greenies”. Quote: “Our contact at WUWT is recommending our Big Oil partners’ CO2 saturating be done randomly through out the U.S., so as to further confound any AGW activists who might suspect nefarious activity.” H.I.’s confidential memos also suggested varying levels*** of CO2 saturation to “befuddle those who become suspicious” and attempt “linkage to Tremors”. ** Explaining why past fracking did not cause earthquakes. Past fracking fluids lacked CO2. Whereas fracking fluid, now saturated with CO2, and once injected into shale – violently react like a shook-up can of Diet soda with Mentos. *** Based on S. Mcintyre’s ‘slight of hand’ with GW temps. to “bury increase” in the noise. This is plain alarmism and simply false. Even the EPA, reluctantly, concluded that an earthquake was likely impossible via fracking. There have been dozens of reports of localized, extremely small, tremors. Not a single report of damage. Too small, too shallow (narrow radiation), and buffered by the fracking compound itself which acts like a shock absorber. Almost all oil and gas wells will also produce some brine (formation and/or connate water). This salt water is generally a lot more toxic than any frac fluid. Frac fluid is probably the least toxic of all completion and stimulation fluids. The vast majority of the wastewater pumped into disposal wells consists of produced formation and/or connate water. There is nothing that will satisfy these tree-huggers. When they demanded Wind Power, they whined about bird strikes. When wind turbine companies resolved the bird strikes, the Greenies protested with not in our backyard. When they demanded Solar Power, they said no because of desert tortoises. Followed by a No to Solar Power because of Hazardous Materials. Remember that it is conventional wisdom – and true – that excessive water is toxic, ranging from hyponatremia to drowning, from excessive dilution of blood electrolytes to respiratory impairment by immersion. Once again, deception is the rule. They studied injection wells and blame hydraulic fracturing. They are two different processes, but since the public cannot discern, it will sell more papers. There is also much more money to be extorted from the production side of oil & gas (than from waste disposal) if you can hold them hostage using sensational media accounts. If only the public understood that so long as radical environmentalists succeed, it is we, the public, being held hostage whenever we purchase an energy product. The cost of fighting off these radicals is paid by the end user. I live in the heart of oil well country in Alberta (NOT oil sands). Back in the ’60’s (before fracking) we moved from the farm into a small town and my mother complained about the town water bubbling and gushing when she first turned on the faucet. We told her it was gas bubbles in the water; she thought we were all wet. 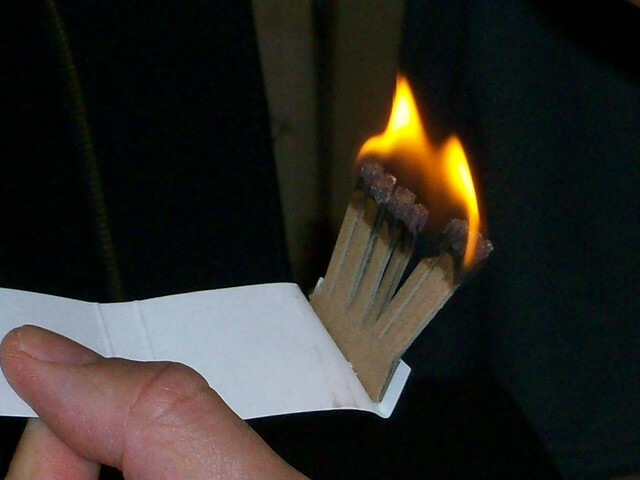 So she lit a match and turned on the tap — burned the curtains over the sink. End of argument. In the same town a friend of mine decided to open a private water well that had been capped several years before – he lit the gas coming out and it burned for 3 days before he could set up a pump. “The basic procedure is to pump a slurry of water and sand into the formation to expand natural fractures… Hence, hydraulic fracturing.” David you seem, refreshingly, to have done some research on the subject, but you have gotten this one point wrong. Fracturing does not attempt to expand natural fractures, but to create new ones through hydraulic pressure. As part of the process, generally a propant is pumped in with the frac fluid. Were it not the fracture would immediately close up. The propant traditionally used is the sand as you noted. The frac fluid is produced back so that the oil or gas may enter the fracture and then it is disposed of in an injection well. The author cites injection wells which inject 150,000 barrels per month. At that rate, the frac fluid would be disposed of in a few hours at most. While the injection of produced brine water would go on day to day for years and even decades. The responsibility of injected frac fluid for any seismic activity that might result would be non existent. Yes, they are intentionally misleading the public, for their own good, just like James Hansen. From what I understand, the fracture itself does not produce earthquakes as defined by the USGS, but it does create seismic signals which can be detected on the surface. As several commenters have discovered, there is confusion with fracing, and forcing waste water into disposal wells. I blogged on The Real Risks of Fracking in June of this year. Most of my information came from a paper presented to the Society of Petroleum Engineers conference this past February, Hydraulic Fracturing 101: What Every Representative, Environmentalist, Regulator, Reporter, Investor, University Researcher, Neighbor and Engineer Should Know About Estimating Frac Risk and Improving Frac Performance in Unconventional Gas and Oil Wells. One of the more famous earth quake events dealing with fracking was a series of quakes in Arkansas. These quakes were subsequently discovered to be caused by waste water injection wells in an area close to a previously unknown fault. The waste water operations were ordered stopped. However, people in that part of the country still think it was the fracking that caused the quakes. The frac fluid and proppant get into the formation through natural fractures and other planes of weakness. Shale has to be fracked because it has very poor permeability. Fracturing treatments change the effective wellbore radius/diameter from a simple 5 to 12 inch round surface area to an effective/comparable 30 foot diameter or more surface area, depending on the size of the treatment. Fracturing for hydrocarbons allows more area for the hydrocarbons to flow out of the formation rock. The result is often enhance production rate and volume over time. For disposal wells the fracturing process is reverse to allow more fluid injection over time. The injection is typically continuous and can be a substantial volume over time. Fracturing for hydrocarbons doe not cause earthquakes. But flukes can happen. But odds would be like winning the lottery. And the seismicity would be very small. Very few wells are drilled as disposal/injection wells. If such wells induce earthquakes they are infrequent and small in magnitude. But then there are those that negatively over hype CO2 increase too. The “bad” is that stress along a fault is never uniformly distributed. There are generally “locked sections” and sections that are mobile. The San Andreas Fault offers good examples of both. The fear would be that relieving stress in one area would actually increase it elsewhere along the fault, or to sympathetically trigger the release of stress in a locked zone in a “palpable” way. The vast majority of seismic activity isn’t “palpable” anyway (see data at quake.usgs.gov), so asserting that only very small movements were found is not telling anyone anything new, unexpected or special. Seeing motion where no one knew there would be motion is an entirely different bucket of worms. That means an entirely unknown fault has been triggered. There are a lot of these around and they can be really unpleasant. The Northridge ‘quake for example was on a previously unknown “blind thrust fault,” a hidden fault where the upper limb moves over the lower at more or less right angle to the fault strike – e.g. the strike is nortth-south, the western side moves (thrusts) eastward above the eastern side. “Blind” simply means there is no surface indications of the fault’s existence. Another characteristic of a thrust fault is that it causes compression – increases stress. The huge earthquake in Japan was a similar motion with the Pacific Plate and the North American Plate (oddly Japan is on the western end of the North American Plate) moved toward each other with Japan riding up over the Pacific Plate. The vertical displacement was as much as 10 meters while the horizontal displacement was as much as 50 meters. Another “bad” is that the stored energy in locked zones can be megatonnes greater than the energy stored unlocked areas. If you can’t predict what the actual energy release is going to be, then do you really want to assume the liability for accidentally triggering a major ‘quake? I can guarantee that the idea has been looked at for decades with no neat solutions. Tinkering might well be worse than not and no way to really tell. Those frightened at the prospect of fracking never consider a cost/benefit analysis. Except in one or two locations [where there is minimal to no fracking], any earthquakes are minor temblors that cause no damage. And as Pamela Gray notes, fracking may well relieve pressure, thereby avoiding larger quakes. So back to cost/benefit: fracking contributes enormously to national, state, and local wealth. Most folks with an IRA account are making money from it, whether they are aware of it or not. So the benefits of the immense added wealth produced by fracking clearly trump the economic Luddites who are trying to stop energy production. Everyone considers the cost/benefit of their actions every day. Get in your car, and you might be killed. But you drive anyway. You fly in airliners, take trains, ride motorcycles, drink alcohol, white water raft, surf, gamble, smoke, use fossil fuels produced by dangerous offshore rigs, and so on. You do not play Russian roulette, race your car down the highway at 110 MPH, or rob liquor stores at gunpoint. Everyone considers the cost/benefit of their actions. Fracking is safe, effective, and produces much wealth. The country needs the energy because without it, costs would be that much higher. So to those wild-eyed scaremongers going to ridiculous extremes over the Precautionary Principle, I say: stay indoors! Do not go outside for anything. You might get hit by a meteorite. David, thank you very much for the pointers. If nothing else, they starkly contrast with what purports to be scientific inquiry in the area of “Climate Science.” Of course, they are more than that, they clearly show to the level of detail that O&G companies go to understand what’s going on thousands of feet below the surface. Actually, I’d hate to have to depend on the quality of the work of some of the Warmistas, were I using work of that quality to try to find oil. I suspect dowsing would be more productive. “May be more common” like nobody noticed… big deal. I grew up in western Pennsylvania. Go to ‘Clarion County, PA’ in Google Earth if you want to see the region. This is oil, gas, and coal country. The early practices were not regulated and wells drilled many years prior to the 1950s had been abandoned. Water and gas still came to the surface. One bubbling pool was about 2 Smoots across and a fallen tree lay at its edge. We would sit on the log and from a book of matches toss a lighted one into the center of the cauldron. Each time, a tiny explosion would burst as the gas ignited. This passed as entertainment before the digital age. Actually, we were hunting white tailed deer. The natural oil, gas, and coal surface occurrences were known about. My Great-aunt Lizzy’s house had gas globes in the rooms from shallow gas piped in from her property. Her water came from the same land but I don’t remember the water, but it must not have been special. The lighting was special because we lived in town and had electric lights and a newly installed gas heater in the living room. Prior to that my family used local coal as a source of heat. In addition to fracking, the related technique of horizontal drilling has produced a wealth of new fossil fuel production. Crank out that harmless CO2, the biosphere needs it! FYI, the term “Yankee” does not appear in the Southern lexicon. See “Damned Yankee”. Both and I would add some journalists are simply lazy. Fareed Zakarias plagiarized, CNN and Time have suspended him. Duster, thanks so much for an informative response. I don’t think the Rio Grande Rift had anything to do with the 1967-69 Denver seismic activity. For one thing, the Rift passes 100+ miles west of denver with a couple mountain ranges between them. The Denver Basin has existed since at least the late Paleozoic. Major faults of Laramide age are quite close. Back in the late 1970’s the link between the Aresenal injection and the Denver quakes was strong, but circumstantial; it could have been just a coincidence. Now 44 years later, without a recurance of the quake swarm in Denver, the chances of coincidence are dropping quickly. I think the evidence that the Arsenal well and the Mag 5+ quakes are a bullseye in X,Y,Z, and T.
Colorado Geology Photojournal with a good summary of Geologic History. What is humorous about this is that fracking is an old technology. The reason fracking got noticed is because journalists love to spice up their stories with industrial jargon, and fracking sounds cool. The technology was horizontal drilling. The trick came about when they learned to frack in multiple completion zones, which is quite a trick for a mile long horizontal bore. But fracking had been around for quite a while. Anyhow, the journalists summed it all up with a cool sounding term: fracking. And the greens want to inject CO2 down wells? Well, that is actually happening anyway for enhanced recovery of oil, but it is humorous. I thought this site was about climate science, but it turns out to be about defending the fossil fuel industry, regardless of the actual topic. My surprise is entirely sarcastic. Great post! I have always wondered why they do not tell the depth of quakes when they report those ’caused by’ fracking. I know the real reason is simple, it would show the fluids COULD NOT have been the cause. Unless, slightly possible, that the fluids caused a slip which then triggered a domino effect. Fracking is at a different depth in almost all cases than any earth quakes I am aware of. The Rio Grande Rift is a propagating structure. It also falls in the category of a narrow rift, unlike Basin and Range which is a wide rift. Generally, rift systems will have one or more boundary faults that somewhat parallel the rift axis. Since it it a growing structure, I would not rule out a fault system 100 miles away as being eventually incorporated into it’s spreading. The Ethiopian rift valley has border faults anywhere from 25 to 125 km from the central axis. (however it is a more “mature” system) The failed New Madrid rift has the Commerce fault off to the west at about 20 to 30 km from the axis, and in some texts it is believed to be the western boundary fault for that system. (yeah, I don’t have the text reference handy, I know, I know.) Though it is on a near perfect alignment with the faulting at Guy Arkansas, I don’t think it’s related. Southerons are first civil, choosing Gemeinschaft over modern and Northern Gesellschaft (F. Töennies, 1887. Transl. 2001, Community and Civil Society, Harris ed.). There are many epithets that, while appropriate in private conversation, a gentleman avoids in public. “I’m on board with the AGW skeptic stuff, but I will likely never be on board with the “fracking is safe” camp. I cannot ever see how injecting toxins into the ground will ever be a good idea, and no one has adequately explained the flammable house water problem to me. My son’s kindergarten use disinfectant to clean the floors, toilets and kitchens and anti-bacterial hand wash to clean the kids hands before eating, they are toxins (designed to kill micro-organisms); should the kindergarten and the authorities be ashamed of their position? They are after all, shamelessly exposing innocent children to toxins every single day. If you ever sprayed fly spray in your house, you were injecting toxins into the very air you breath but you wouldn’t have been ashamed that you put yourself and any visitors at risk of exposure to what is more or less nerve gas would you? Hydraulic Stimulation involves injecting mostly water into a formation to above the rock’s fracture pressure causing a fracture to open and propagate into the formation, increasing the surface area available for hydrocarbon migration into a well. Proppant (sand) keeps those fractures open once the pressure is relieved and the additives you heard activists wringing their hands over in gassland consitute 0.5 – 2% of the fluid by concentration. Additives are included to reduce the friction of the fluid while flowing (requiring less energy to pump the fluid – less CO2 emissions then), inhibit corrosion, prevent micro-organisms fouling the fractures that are created and to reduce the impact of drilling fluid invasion of the formation. The frac fluid then flows back out of the well once the stimulation is complete and is either disposed of down an injection well or re-used (which makes more sense to me), if it did not, how would the oil or gas in the target formation flow into the well to be produced? Why be ashamed or unneccessarily frightened of such a benign industrial process? Be ashamed of leaving toxic anti-bacterial hand wash lying around your house unsupervised. The flammable house water problem is easy to explain; it’s gas migrating into aquifers. In the same way that oil seeps out of the sea floor into the gulf of mexico, it’s all perfectly natural and been documented since long before fracturing was a possible scapegoat. I think the outcry is more over the fact that oil and gas haven’t peaked after all and “this has gotta be stopped!” We owe a lot to the much maligned “Big Oil” for our prosperity and wellbeing. And for those who think that this sector is being subsidized – that is a lot of hooey. On top of this, the oil companies pay corporate taxes, their employees pay income taxes, gasoline stations pay business taxes, income taxes and their employees pay income taxes. I had a friend with a two pump country gas station and auto repair shop with two mechanics. He showed me how his business made $500/day for the governments and a lot less than that for him – and that was 30 years ago! Listen, the only reason the greenies haven’t been able to shut down “Big Oil” is because the actual industry is more “Bigger Government” in terms of profitability. The much ballyhooed “subsidy” is essentially legitimate tax deductions associated with wasting assets – declining reserves that have to be replaced with more expenditure. Your solar panel inc. gets tax deductions for depreciating manufacturing equipment, vehicles, tools at 20% a year and even your buildings at about 5% a year – this is over and above maintenance. I get a kick out of this “subsidizing the oil companies” – this is the biggest industry generator of government income there is. “I heard the rumble that actually did turn out to be the earthquake,but needed ten seconds to figure out which it was. Not a big deal. The news keeps trying to blame it on fracs. I don’t doubt what you say about Rifting in general and the Rio Grande Rift in specifics. I just find any link between it and Denver seismic activity since 1950 to be non-existant. Look at the Colorado Earthquake and Fault Map (pdf) Do the pink dots show any affinity with a N-S lineation that could possibly be linked with the Rio Grande Rift? Or are they more like clustered around a point source? When I first saw this map yesterday, I was surprised at how many of the large circles were in the denver area and how few in other places. Now it is true that Denver is probably well covered with seismic stations so we are more likely to record 2s and 3s in Denver rather than in the San Luis Valley, But I don’t think 5s anywhere in the state will go unnoticed. Note the depths of the 1967 triplet. When I did this same search two years ago, I was sure I got a third Mag 5 in 1968.
http://www.aapg.org/explorer/2010/10oct/seismicinduction1010.cfm AAPG Explorer Oct 2010: “Yes, Virginia, there is Induced Seismicity”. Written by David Brown with Frohlich as a principle source. Article covers The Geysers of California, Denver, Basel Switzerland, with an emphasis on a Dallas 2008 Barnett Case Study conducted by Frohlich, Stump, and Hayward. This is a good summary of the Denver Arsenal, Rangely Oil Field controlled injection experiment, a salt water control operation in the Paradox Valley Delores River, and the most recent episode in the Raton Basin. The Raton case is possibly associated with a coal bed methane project and a well for disposal of “de-water operations” that took 2.5 million bbls of water in a year. That is 106 million gals, about 2/3 of Denver Arsenal in less time. Aside from the opinion pieces here I will say what I do know. Not what I think I know. Near me the town of Blackpool, England, they started fracking in a prime location. They reckoned it could have enough gas to keep us going for many years to come. Then came two localised earthquakes right in the fracking zone. Work was halted. The Canadian firm who invested millions in start up costs wish to carry on but are warned they will incur all damages and costs. now want the Gov’t to push it through by law. Déjà vu. Earthquakes in England that can be felt underfoot are extremely rare – possibly a twice in a lifetimes experience if you live in the right place. The odds of two separate hits right over the drilling zone almost go far beyond chance. The locals were originally backing this apart from a few who did not think using the mined out salt domes for storage as very clever or safe. Opinions are now very wary to emphatically against it. In the USA it is common knowledge aquifers have become poisoned. People became ill. Others have massive amounts of gas explosively coming through their taps. Animals have mysteriously died. Methane is now bubbling up from all sorts of ponds, creeks and rivers. That is what they know of! RT.com plays a pretty horrible documentary about the frackers Mafia/legal tactics to enforce drilling on other peoples land and commonly installing the wells only 200′ from the farmsteads amongst all the other horrors. What bothers me about drilling for methane is Radon. If the gas companies had the same enforcement on radiation; they would be shut down. Check out this historical marker.. Apparently fracking dates back to the 1600s! You jump from earthquakes to methane to radon. Relax, there is nothing dangerous about fracking. And think of the enormous amount of harmless, beneficial CO2 it adds to the biosphere! And folks in L.A. would laugh at what you call earthquakes. The biggest you have ever seen or felt in England is nothing. Nothing at all. So the cost/benefit analysis says: frack away! There is really no downside. Correlation does NOT equal causality. Even if one of the correlating events are rare. If tomorrow there was an earthquake and you lived next to wind turbines, would you blame them? Especially if they just went in? People get sick living by turbines. That would make those evil too. One of the problems with this whole water discussion is people seem to believe ground water is completely enclosed and utterly safe unless some evil fracking company comes along (I would note that blaming the fracking company so they will pay $6000 for a new well when a well goes dry may seem cool, but it’s not. It’s bad behavior. And bad science.) ANY cutting into ground water can contaminate it. Heck, I can pour fracking chemicals down my well and blame the gas industry. Just like I put the chlorine in to kill the e-coli in my well. Methane underground can seep into the well (remember, no barrier–aquifers are not water tanks) and result in water that can “burn”. I live in a state with oil underground everywhere. It’s natural. It also makes my “good” water (which is what realtors call water that needs an RO system–I’m not being sarcastic) full of sulfur and other particulants. My water LITERALLY eats my metal plumbing fixtures after 5 or 6 years. I try to use cheap plastic ones wherever possible. Well water is not sparkling pure in many, many places. You say you have seen things first hand. I have lived around gas and oil and uranium for thirty years. I see none of what you see when you watch slanted media accounts and people trying to blame someone for their misfortune. That is what I know. A quote from the original (the good one) Battlestar Galactica: “What the Frack!”. 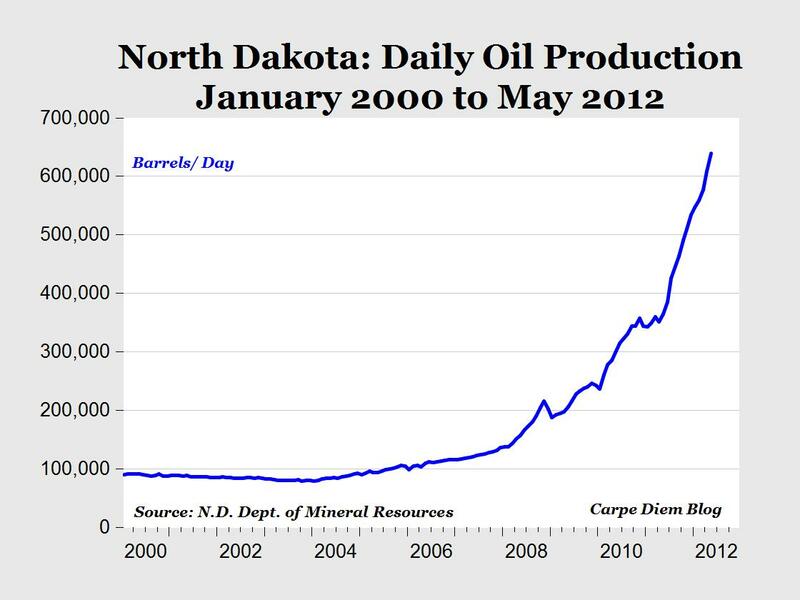 Has it ever occurred to the “Greens” that if they hadn’t tried to shut off drilling in Alaska and offshore then “fracking” wouldn’t be necessary or profitable? If you want to blame George Bush for Katrina, blame AlBama for earthquakes. Each magnitude level represents about 31.6 times more energy released. It takes 32 magnitude 3s to equal the energy released in a magnitude 4, 1,000 magnitude 3s to equal a magnitude 5 … and a billion magnitude 3s to equal a single magnitude 9. So while a small quake may temporarily ease stress on a fault line, it does not prevent a large temblor. Methane used to be known as “swamp gas”. Ever wondered why? on the burning tap water Erny72, don’t forget the other on-site studies showing natural methane from shallow bogs and other natural rot just below ground level. As you note, it’s all a big lie. We’ve even got residents sharing family history of burning water going back to the 1800’s – long before ANY drilling. Jason would be encouraged to do some ACTUAL research on this subject instead of relying on KOS and Huff-N-Puff Post and other hyper-ventilating pits of nonsense for his “facts”. I have to disagree with you start date for fracing in the Barnett Shale. I was the engineer working for Mitchell Energy in the early ’80s when we started drilling for the Barnett on purpose. It had been encountered for as long as drilling had been going on in North Texas. It was responsible for several blowouts when drilling for deeper plays. Attempts were made to complete in the Barnett but none were successful due to the extremely low permeability (measured in the nanodarcy range). The first well, C. W. Slay #1, was completed only by perforating due to the fear of what water would do to a shale. We then moved along in a very expensive series of steps. We stimulated wells with injections of nitrogen only, CO2 only (yes, way back then than nasty GHG was used in the oil field for injection), foamed CO2 w/sand, CO2 w/water and sand (the CO2 was used to help unload the well faster). Finally we went to a straight gelled water w/sand completion using about two million pounds of sand. Mitchell had already done five million pound frac jobs over in Limestone County. These wells were all vertical completions. I lost track of the goings on after the bust in the mid-80’s but it is the combination of the horizontal drilling and the massive frac jobs that make the tight shale gas development economical, albeit at today’s price for gas it is marginal at best. Seconded. When will the super-successful solar electric sector have their unnecessary subsidies snipped? The oil just keeps a-comin’. And as the efficiency of its use continues to improve, I am more and more impressed. Slowly but surely the idea that it is abiotic is slowly sinking in like a grease stain on a concrete floor. No matter how cement-headed the ‘fossil fuel’ believer, it is permeating the collective consciousness: there is a lot more than was heretofore believed. It was mentioned above that oil is not found/searched for at major fault lines. Well, there is a school of thought that holds the opposite: that the largest oil finds will be at the places where it is able to rise from its place of ‘manufacture’ in the heated deeps. Keep your eye on Haiti and what happens there offshore in the coming years (it is a place of major faults and Big Oil is snooping around). Proppants are said above to be sand. There are also ceramic proppants with much higher strength and consistent size and shape. See for example http://beta.globalspec.com/featuredProducts/detail?ExhibitId=195273&uid=%2D1459711991&frmtrk=alert Their advantages include having a controllable density to assist mixing and placement at a particular site. The oil and gas companies are so rich they could give us each a million dollars and it would not touch their bottom line. Instead we are paying taxes to subsidize these corporate raiders who are in our faces saying that fracking does not contribute to earthquakes, and belittles and bullies anyone who tries to stand up to them. If you folks in Arkansas believe that drilling deep into the earth, fracturing the rocks, then injecting mystery fluids into the cracks, is not in any way connected to your earthquakes, then you deserve them.